464 pages | 185 B/W Illus. Since the emerging discipline of engineering enterprise systems extends traditional systems engineering to develop webs of systems and systems-of-systems, the engineering management and management science communities need new approaches for analyzing and managing risk in engineering enterprise systems. Advanced Risk Analysis in Engineering Enterprise Systems presents innovative methods to address these needs. With a focus on engineering management, the book explains how to represent, model, and measure risk in large-scale, complex systems that are engineered to function in enterprise-wide environments. Along with an analytical framework and computational model, the authors introduce new protocols: the risk co-relationship (RCR) index and the functional dependency network analysis (FDNA) approach. These protocols capture dependency risks and risk co-relationships that may exist in an enterprise. Moving on to extreme and rare event risks, the text discusses how uncertainties in system behavior are intensified in highly networked, globally connected environments. It also describes how the risk of extreme latencies in delivering time-critical data, applications, or services can have catastrophic consequences and explains how to avoid these events. With more and more communication, transportation, and financial systems connected across domains and interfaced with an infinite number of users, information repositories, applications, and services, there has never been a greater need for analyzing risk in engineering enterprise systems. This book gives you advanced methods for tackling risk problems at the enterprise level. "The book develops several topics in risk analysis, including models and measurement of engineering risks, capability portfolio risk analysis and management, functional dependency network analysis, and extreme-event theory. Several chapters present some tools from applied probability and statistics … A reader with main interest in statistics may find in these chapters several ideas about the use of specific statistical tools in applied engineering. Questions and exercises are provided in each chapter to help the reader understand the main topics." 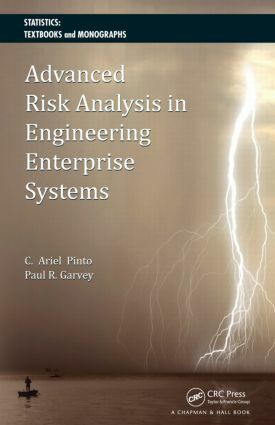 "…excellent references … appropriate for risk engineers or quality professionals wishing to gain a comprehensive understanding of the engineering or mathematics behind advanced risk analysis. … I would certainly recommend this book to anyone working in high-risk, complex environments, such as nuclear, aerospace or explosives." "The book is a decidedly unique and rigorous treatment of selected topics in engineering systems risk analysis and management. The narrative is notably modern and clear. The mathematical formalism is comprehensive and advanced while remaining accessible for those involved in engineering complex systems. This is foremost a book of exciting and innovative ideas for the field, exceeding what might easily have been a rote assembly of worn methods or re-introduction of the works of others. It will be of long-standing appeal to practitioners engaged in the analysis of risk in engineering enterprise systems. The book will also appeal to scholars and researchers who will benefit from the advanced and fresh thinking it offers readers. The book will improve the systems engineering community’s ability to address enterprise design risk assessment and management across a system’s lifecycle." Questions and Exercises appear at the end of each chapter.